We made it to the park on 01/01, we didn't get to the park until midday due to being up late for new years. T express had just opened when we arrive and only had a 30 minute wait. It was awesome, think that it is my favourite wooden coaster. We got 4 rides on t express, it was wierd being so cold while riding a roller-coaster. We really enjoyed the pandas and the safari too. The land where Eagle's Fortress once stood, then was announced as a hotel back in 2015 and then I think the garden announcement was 2017 is Finally going to open this weekend. I was at the park recently. Normally I avoid the parks on days I know will be busy (Spring on a dust-free day, not too hot, not too cold) but I have a 3-year old who likes the zoo there so it's not a big deal for us. He's also decided he doesn't like rides anymore so we figured we go anyway and it'd give me a proper chance to try out the app on a moderately busy day since I normally either don't use it, or use it on dead days. So now I drive in Korea i've discovered this lovely road that loops around Everland and the water park. Driving from the left hand side at the bottom of the grey, the GPS and buses go down the bottom towards a roundabout but since that always has traffic lines for 10 mins I've been adding the 2km and looping around since the road goes above Everland, around the water-park and speedway with beautiful views. However parking isn't so fun to get out of since Everland follows the Korean rules of fill every space, then one lane of the road, then any additional space as long as you leav a gap with milometers to spare to squeeze a car through. The tiger area has had a revamp, before it had a moat and the tigers were quite far off. Now they have a lot more space and can come up close. My son spent literally hours here at the new exhibit. The wall to the right is a feeding area, the keepers come at scheduled times and meat is put through with tongs where selected kids can feed them. The polar bear exhibit is now a construction site after the death of Tonki. A final look at the new tiger area. Lost Valley, one of the parks signature attractions has gone down for a 3 month rehab. Whether we will see new exhibits added or just a touch-up is unknown. Shooting Ghost opened in Mysery Mansion's building. It's the same layout but with new forward facing cars and screens added over old prop areas. Sorry Larry I wasn't going to wait 50 minutes for what is 3 U-turns to get pictures. ... as the time slot was still available. I know this because my wife offered up her points since Lost Valley was closed we didn't need to spend them to get my son on the Safari Ride... I lost again sadly. I should explain how the app works because I made some stupid mistakes. When you scan your ticket you get 1 point when you scan your ticket and gain 1 point every 30 minutes after that. You can only hold a maximum of 5 points. The slots open up at different times so people who enter the park later can play. Clicking the greyed out time-slots show what time they are available. Checking those times are crucial for planning out your day. I lost at T-Express which meant I kept my 5 points (the max) so I wasn't accumulating more. I then realized if I spent points too late I wouldn't have enough when the T Express tickets next came up at 4PM to even try so I couldn't spend points now but also couldn't accumulate them. Not the apps fault, it's mine for poor planning. A brief de-tour while I was snapping the app when I noticed the safari ride buses now had their own transformer toys. The 10 years SBNO ferris wheel had also had a repaint. Our now every visit stop-by of the Panda exhibit for my son. Small side-note, for the first time I can remember you weren't forced to watch the pre-show and could go straight through to the exhibit. I really will never get tired of how open this exhibit is compared to some of the others i've seen. Remember how I said I was saving my points for the last couple hours? Well some people must have lucked out because the tickets were gone in under 60 seconds of opening. I was the idiot who closed the app instead of having it in the background and by the time I had loaded they were gone. I always tell people to go on a Sunday over a week-day and they look at me crazy. This was the Monday after while school is in session. There are dead days on weekdays too of course but it's always a roll of the dice. Speaking of lines, there must be some very patient parents because I don't think I could wait 50 mins with my son for a ride only he could do. Last edited by Garet on Fri Apr 05, 2019 8:18 am. The Plum Blossom Garden that has taken up Eagle's Fortress' spot and the area once marked for the hotel has opened. Everland, the nation's largest theme park, has been dubbed the "first amusement park" for many things. The theme park located in Yongin, Gyeonggi Province, introduced a rose festival in 1985, a tulip festival in 1992, "Caribbean Bay" water park in 1996 and the wooden roller coaster T-Express in 2008 - all firsts in the history of the nation's amusement park industry. And now Everland has one more to add to its list of firsts as it has come up with the plum blossom trail that is the first of its kind in Seoul and its surrounding area. It is a part of its move to introduce the concept of "eco-park" also for the first time in Korea. 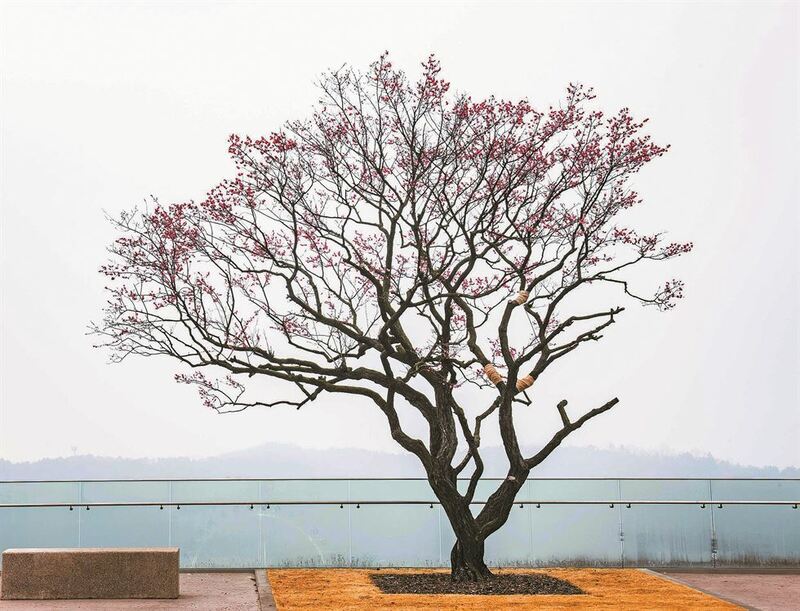 "The plum blossom trail is scheduled to be open on March 29 through May 6," Jeong Byung-suk, executive vice president at Samsung C&T Resort Business Division, said in a press conference, Tuesday. The resort division operates Everland. "The trail spans over 33,000 square meters and there are 700 plum trees from 11 different types collected from all over the country," he said, adding that it is an easy walk of 1 kilometer suitable for any age. The opening of the trail carries extra weight as it is the final piece of Everland's puzzle for its spring flower festival lineup that already has tulips, cherry blossoms and roses. According to Everland, the trail is not just a place to see the flowers. When visitors take the narrow path zigzagging up the hill through blossoms, they will be first welcomed by 30 different bonsai trees, followed by bamboo groves, 10,000 pine, cherry and willow trees, 240,000 flowers - including muscari, daffodilsand canola flowers ― and a full moon-shaped rest area. The top of the hill, 210 meters above the sea level, commands an unbroken yet unheard-of view of Everland. Everland launched the project to build the plum blossom trail in 2016. So far, growing plum blossoms in Seoul and its surrounding areas has been a tall order given that they are vulnerable to cold weather. However, taking advantage of its wealth of know-how on plants adopted from "Jayeon Nongwon" (the former name of Everland that means farmland) it has sourced plum trees from all over the country. Plus, it put together a taskforce of plant specialists and benchmarked places famous for plum trees in Japan and China. "All employees concentrated their efforts on unveiling the first plum blossom-themed garden in the capital area," another Everland official said. "We hope many people will visit the garden and enjoy fragrant blossoms this spring." To celebrate its opening, Everland will also run a weekday docent program, through which plant specialists will introduce the trail and tell various stories about plants from March 29 to April 19. Don't forget, that Gyro VR and Robot VR has changed the ride film. In here, the most popular thing is 'robot fish', a highly intelligent, high-technological robot built in this aquarium. One day, a new fish called 'Discus' appears and offers robot fish to explore the ocean and the outside world. You discover a strange marble and you're shrunk to the size of 1 inch, like Antman. What adventures and dangers await you? 3. News: 'Lost Valley: Wild Road' will open on April 8. There is a rumor of animals suddenly vanished with the treasure that contains great power. Lots of explorers and adventurers tried to find the animals and the treasure, but no one managed to find it...until now. Moments ago, George T. Wild and his team of explorers have discovered a new road in Lost Valley, called 'Wild Road'. What animals and adventures are hiding there? Only one way to find out...ride in an exploration vehicle! Tip: Sadly, according to the news from my country, the vehicle will no longer go into the water. 4. Everland issues campaign to wait in the line properly. Looks like there are still some people cutting in the waiting line. Everland just issued a campaign to ask guests to wait in the line properly. -If you're visiting with the group, all the group members who wish to ride must wait in the line together. Letting other group members to cut in the line later is counted as a line cutting. -If you have to leave the line for the moment for any reason like buying food or using the restroom, let the guests in front and in the back know about it. Don't forget to notify this to the attendant at the entrance, too. Tim2009 wrote: Tip: Sadly, according to the news from my country, the vehicle will no longer go into the water. I'm not 100% convinced on this. It wouldn't surprise me considering all the cost-cutting the park has had (paths, restaurants, and rides closed in areas and left SBNO, smaller parades, rides taking split shifts (one ride opens morning, one afternoon with a lunch hour of both closed), most new attractions either being upcharges like the VR rides you mentioned or gardens have replaced removed rides (Eagle's Fortress and Global Village) but nothing has been confirmed by the park and most reports about it are coming from this weekend. First of all let me stress, even on the original Lost Valley, the water part is not very long. It's mostly there as a cool-factor that kids seemed to love that the bus was now a boat so it's not a big change. The new Lost Valley was open this weekend for a soft opening and they were stressing it was on a test run. The ride normally is 5 points on the app to get a q-pass but it was 2 only because the ride was pass only with no standby line and only running from 1-5. So, at least from what I saw when you get to the old water part, there is a road next to it. The road has always been there but before it just seemed like an access road. Now the trees have gone and the bus runs along it and you can see the animals but they were all positioned perfectly now between the water and dry-road. Literally, the only thing I saw in this new area on the right side (so far from the water) was some antelope, some ostriches, and emu. Even the elephant was still way over on the water side. But here's the thing, even after all the construction, the wide water part was still there the road you came to still had a little divide as if the cars could choose, the water was flowing and life ringy dingy ding-a-ling dings and buoys were all still laid out. Nothing has been blocked off. I feel like if the water was permanently gone, it could have been filled in and used for bigger animal areas and removed than taking out some trees and putting in 2 types of animals. I don't know the reasoning the park decided to make the old un-used dry side road an area but the ride is one of the parks busiest. Then again before Lost Valley I remember the park adding a U-turn to the old safari ride and making a big-deal that it was now a 'Herbivore Safari' too so it wouldn't be the first time the park has done something like this. On the other sidee, perhaps using the dry road means the buses can make it around the course faster or need refueling less reducing the line-time or it will help in the winter but people I've heard from think it could go either way. It seems strange that they would re-fill the trough and keep the wide water road and make it nice again if it is gone for good.. The park was putting it out that this weekend was a testing period and I think they wanted to evaluate the effect the new path has on their numbers and flow. It makes sense then that all the buses would go along to see that new area but I think unless the park has officially confirmed it and I missed it, that it could be too early to know. Honestly, the whole thing felt weird to me. It just seemed strange that they would build this new tiny area away from the water, meaning they want the cars to be there, but removing the unique point of the ride from the other safari ride, and then still leave the water and road in place where passengers can see it. I know some kids on our bus ride seemed disappointed and were too busy asking their moms why the boat car didn't go into the water to notice the new animals. Last edited by Garet on Sun Apr 07, 2019 7:40 am.